The Industrial and Management Engineering program at Rensselaer is accredited by the Engineering Accreditation Commission of ABET, http://www.abet.org. The program has last been accredited on Aug, 2013. The accreditation cycle is every 6 years. 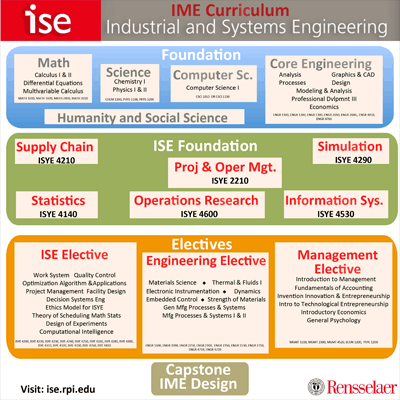 The ISE department offers an undergraduate curriculum in Industrial and Management Engineering (IME). The first two years of this curriculum provide a strong foundation in basic science, engineering science, mathematics, and the humanities and social sciences. These two years are oriented toward the quantitative (mathematical) approach. Computer-based technology, including simulation, computational modeling, and systems design, is emphasized. In the last two years of the program, students concentrate on building expertise in statistics, operations research, manufacturing and services engineering, and industrial engineering methods and models. Through the appropriate choice of electives, students can focus on their selected areas of interest. Design projects include problems in manufacturing, services, and public systems. It is advisable to develop a Plan of Study leading to the desired degree and concentration by the beginning of the third year. The department recommends that students declare their intent to major in Industrial and Management Engineering as early as possible in their academic career. Students are also urged to work closely with their assigned faculty advisers to ensure that all degree requirements are satisfied. This curriculum requires a minimum of 131 credit hours and completion of the course requirements shown in the typical four-year program presented in the adjacent catalogs. Please consult the catalog for your class as these are not identical. How does ISE differ from other engineering disciplines? It encourages broader business orientation. pursue professional positions in industry and/or graduate study programs in their areas of interest. contribute to the body of knowledge in their professional discipline through problem-solving, discovery, leadership, and responsible application of technology. continue to develop both professionally and personally through activities such as participation in professional societies, continuing education, and community service. an ability to integrate management systems using appropriate analytical, computational and experimental practices into a series of different technological environments. The Arch (previously known as the Summer Arch) requires rising juniors to remain on campus the summer between their sophomore and junior years to immerse themselves in academics and experiential activities. The students then use either the fall or spring semester of their junior year as an “away” semester. Students are advised to contact the Center for Career and Professional Development, CCPD, for additional information and help. Details of the Arch program can be found in the Arch Fact Sheet. Students should consult the ISE Summer Arch Draft Curriculum Template for courses. In 2017, Rensselaer launched the first of two pilots of the Arch program. Rising juniors (members of the Class of 2019) from the School of Engineering and the Lally School of Management had the opportunity to stay on campus and participate in the Arch program. In 2018, the second pilot was launched, and rising juniors (members of the Class of 2020), enrolled in all schools, had the opportunity to participate in the Arch program. The ultimate launch will take place in summer 2019 and will include all members of the Class of 2021. We encourage incoming IME Freshmen to consult this readng list to help them get a more deep and thorough understanding of the field. 1.) Kim, G., Bahr, K., Spafford, G., The Phoenix Project: A Novel about IT, DevOps, and Helping Your Business Win, First edition, IT Revolution Press, 2013. 2.) Goldratt, Eliyahu M., 1947-2011. The Goal : a Process of Ongoing Improvement. Great Barrington, MA :North River Press, 2004. 3.) Wolfe, Tom. The Right Stuff. New York: Farrar, Straus, and Giroux, 1979. 4.) Lewis, Michael. Moneyball: The Art of Winning an Unfair Game. New York: W.W. Norton, 2003. 5.) Assad, Srjang A., Gass, Saul I, Profiles in Operations Research: Pioneers and Innovators, Springer, 2011*.